A surface hardening process whereby heating is done by induced electrical current. A high-frequency electrical current flows through a copper coil, producing a magnetic field around the part. A surface hardening process offering a high degree of automation, increased production rates, and flexible process parameter design. Laser processing uses a well-defined, intense energy beam as a heat source. While improving the wear properties of metals, the process allows metal to maintain ductility. ...include agricultural equipment, automotive, electrical and electronic equipment, power equipment, medical device, mining equipment, security device, and tool & die. National Metal Processing recently installed a second 36-48-36 Surface Combustion Allcase batch integral quench furnace with oil quench, a Uni-DRAW temper furnace, and a powder metal Uni-DRAW temper furnace. National Metal Processing now has Pillar vertical twin-spindle induction capabilities, 150kW, with touchscreen monitoring. 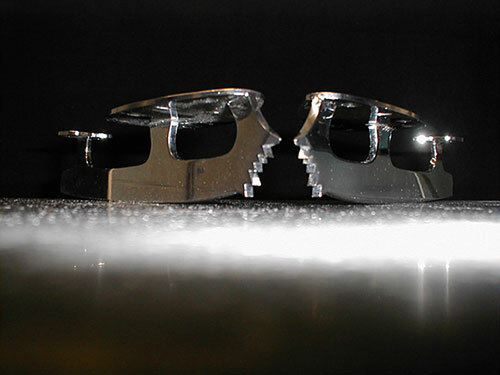 National Metal Processing provided induction heat treating services to a supplier of ice skating blades as seen below for the 2002 Winter Olympic Games in Salt Lake City.